The broad coalition of trade unions – led by IndustriALL and UNI – and 80 market leading clothing brands and retailers today announces the next steps to implement the historic Accord on Fire and Building Safety in Bangladesh. July 7, 2013: The signatories to the Accord, IndustriALL Global Union, UNI Global Union and the over 80 clothing brands and retailers, set themselves a 45 day period to draw up and agree on the implementation plan and 8 July is the deadline. The Accord represents a new era of collaboration and sincere efforts to make the Bangladeshi garment industry safe and sustainable through comprehensive inspections, repairs of factories, training and involvement of workers. All parties to the five-year binding Accord on Fire and Building Safety in Bangladesh are enthused by this milestone and the real work on the ground will begin soon. Initial inspections to identify grave hazards and the need for urgent repairs. This will be completed within 9 months. An Interim Procedure to take effect when existing inspection processes or worker reports identify factories which require immediate remediation measures. Hiring process commenced for the Chief Safety Inspector and Executive Director positions. Governance structure established through a Steering Committee with equal representation of signatory companies and unions and an Advisory Board with broad representation in Bangladesh. See the report of the implementation team attached for full details. The Accord will cover all factories producing for the signatory brands, opening them all up for safety inspections and further measures depending on the factory’s significance to the brand. Signatory brands and retailers guarantee that in every case where an unsafe factory is found funds will be available for the necessary safety upgrades. The Accord will be governed by the Steering Committee with equal representation of labour and company members. The Steering Committee will be empowered to take decisions to resolve disputes, with the arbitration to be enforceable in a court of law in the company’s home country. The selection of the Arbitrator in this process will be governed by the UNCITRAL Model Law on International Commercial Arbitration 1985. All action of the Accord will be transparent and publically reported. The International Labour Organization (ILO) acts as an independent chair to enhance the Accord’s implementation. The labour NGOs Clean Clothes Campaign and the Workers’ Rights Consortium played an important role in supporting the Accord and will continue to do so throughout its five year duration. Of fundamental importance to the Accord is that it includes a central role for workers and their representatives. Another central aspect of the Accord is that it commits signatory companies to staying in Bangladesh for at least the first two years of the Accord. The signatory companies to the Accord are making serious and sincere commitments to working with trade unions to clean up their production chain in Bangladesh. They can all be held up as standard-setters in the industry. 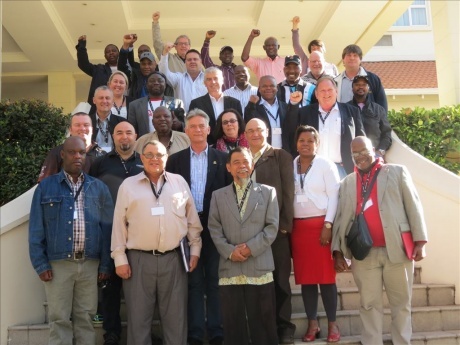 At the end of June thirty mining union delegates from across the world at Rio Tinto operations met in Johannesburg to map out a global campaign strategy, marking a significant milestone in the process towards the launch of a campaign against the corporation. July 11, 2013: At its inaugural merger conference in 2012, IndustriALL resolved to launch a multi-coordinated, multi-union global corporate campaign against Rio Tinto for its legendary anti-union and unsustainable labour and community relations practice, including environmental practices and conduct across the globe. With the launch of a Rio Tinto Global Network responsible for driving the global campaign, the June meeting in Johannesburg marks a significant step forward. The purpose of the global campaign is to force a seismic shift in the way that Rio Tinto relates to workers and trade unions across all of their operations. The specific objectives are to increase trade union density in its operations globally and a recognition by Rio Tinto of trade unions and of IndustriALL Global Union as a formal interlocutor or counterpart. Part of the strategic outcome of the meeting was the launch of a strategic alliance against Rio Tinto (START), envisaged as an alliance of progressive social, community, environmental, faith-based and economic justice network. To this end, an environmental activist persecuted for exposing mining environmental abuses in his country addressed the meeting. A Researcher at one of the leading universities in South Africa also addressed the meeting on the community abuses and social dislocation associated with mining in his home country. IndustriALL and UNI, reacting to the announcement by Walmart and Gap today of another toothless corporate auditing programme for Bangladesh factory safety, stated that these companies are only repeating the mistakes of the past. July 10, 2013: The Walmart/Gap initiative falls short of the standard set by the binding Accord on Fire and Building Safety in Bangladesh. The Accord is an enforceable building safety programme backed by more than seventy global brands from 15 countries. Unlike the Accord, the Walmart/Gap initiative is unclear on enforceability and there is no commitment from the brands to stay in Bangladesh, nor is there full transparency. The Constitutional Court in Belgium has decreed that the status of blue and white-collar workers need to be harmonized, urging the government to eliminate the discrimination between the two types of workers. July 11, 2013: The discrimination had been going on for a century and an attempt to stop it had been blocked for 27 years, when the government finally managed to find a compromise in June. It was the solidarity between the two types of workers that made the agreement possible. It means that the classification of blue or white-collar, or manual and non-manual, worker, will disappear. Simply the term “worker” will remain. The former blue-collar workers seem the most satisfied by the agreement as their notice period will be extended and granted according to seniority. Moreover trial periods have also been scrapped, and all sick days will be paid, whereas before the first day of a sickness was unpaid. However, not all differences between the two types of workers have been withdrawn. The calculation and the payment of annual leave, wage and salary payments, short-time work are still pending and will need to be settled by the Labour Council, a national body. Employers are afraid that the costs for firing workers will go up. And the unions are afraid that employers will have recourse to more temporary work. The unions will join the negotiations at the Labour Council where the details will be worked out, hopefully in the workers’ interest. The final differences will have to be ironed out by the social partners within a certain deadline. The Asociación de Supervisores de la Industria Metalmecánica (ASIMRA), affiliated to IndustriALL, has put its members on a state of alert in response to the employers’ refusal to discuss changes to the job classification categories set out in the current collective agreement. July 10, 2013: The union, led by Luis García Ortiz, has issued a press release denouncing the employers’ rejection of union demands for a pay rise and changes to the job classification system in both the manufacturing and administration sectors of the industry. The union accuses the employers of failing to respect the agreement’s clauses on maintaining job categories under review in order to take account of new production methods and technologies. ASIMRA accuses employers of trying ¨to make us believe that Argentinean industry operates like a village smithy”. The union held a rally at the offices of the employer’s federation on Monday 1 July as employers were holding a meeting at the Ministry of Labour. Roberto Martín Navarro, ASIMRA Secretary, said that the union wants a review of the job classification system. He explained that the union went to the negotiating table with the aim of “updating basic aspects of the agreement. When they won’t agree to what we are asking for, they always start talking about paying us one-off lump sums. We requested changes to the job classification system set out in the collective agreement, in order to bring it up to date with new technologies and production methods”. Navarro added that the categories in the current job classification table, “were established in 1975 and 1994. We think that things have changed since then, especially the role of supervisors, and we hope that the employers will review the situation to bring them up to date with the current situation”. He said the union has put its members on a state of alert and called for the government to mediate in order to achieve an agreement. IndustriALL has communicated its solidarity to our colleagues in ASIMRA in the union’s fight for improvements in the conditions of its members.